One of my favorite things to do is create delicious recipes in my kitchen for friends and family to enjoy. Whether it is baking banana nut breads and pecan pies, or cooking up some of my famous hot wings or just frying a cheese omelet I enjoy putting new ingredients together. Experimenting with new spices and adding different things to traditional recipes are always fun. It’s great when someone eating my food asks if I put a certain spice in the dish. Aside from seeing the enjoyment on people’s faces it’s always fun to have people guess about special ingredients. Aside from quality ingredients the next item of importance in the kitchen are the tools you use. The cooking utensils, pots, pans, baking dishes and more. In the past I didn’t put much thought into what type of cooking pans and pots I used. The big thing when I really started getting into cooking was those non-stick pans. Now many years later we are finding out that those pans may not be that good for you. For example after using them for a while little bits and pieces of their metal coatings can come off and get into your food. Many of these aluminum non-stick pans degrade over time allowing metals to end up in your food, which in turn ends up in your body. There are several alternatives to using these types of pans. They are stainless steel, cast iron, and ceramic pans. Stainless steel pans are very popular with chefs all over the world. They are not too heavy, and they heat up the food pretty evenly. One complaint I have about them is how difficult they are too clean, especially if you have burned some eggs with cheese in them. Cast iron pans are another alternative that takes a bit longer to heat up but stays hot longer even after removing from heat. They are very heavy and their handles get hot. Cast iron pans are also not that easy to clean and should be oiled after every use. That leaves us to discuss the final alternative, which are ceramic-coated pans. These pans resemble non-stick aluminum pans in many ways except they do not contain those harmful metals. 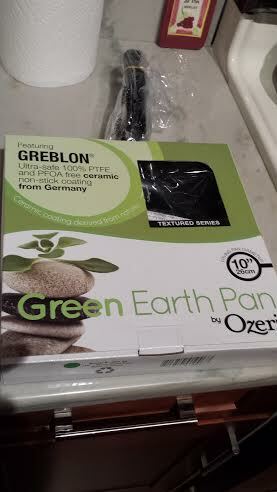 One ceramic pan that I recently got to try out in my kitchen is called the Ozeri Green Earth Pan. It uses Greblon – a ceramic coating made in Germany that promises to be PTFE and PFOA free. The cooking surface is like nothing I have ever seen in a pan. It is not smooth but textured. They claim it delivers better heat distribution and non-stick performance without releasing harmful chemicals. They also claim that the surface is 100% ceramic and scratch resistant. Notice they use the words resistant not scratchproof. I don’t think any pan can be scratch proof unless it was diamond coated and that would be some expensive pan. Imagine saying, “I cooked these eggs on diamonds”. That would sound weird. Ok, so back to the Ozeri pan it also has a specially made bottom that helps transfer heat quickly and evenly especially on those special magnetized induction stove tops. After reading and hearing about all of these features I was eager to give this pan a trial run in my kitchen. 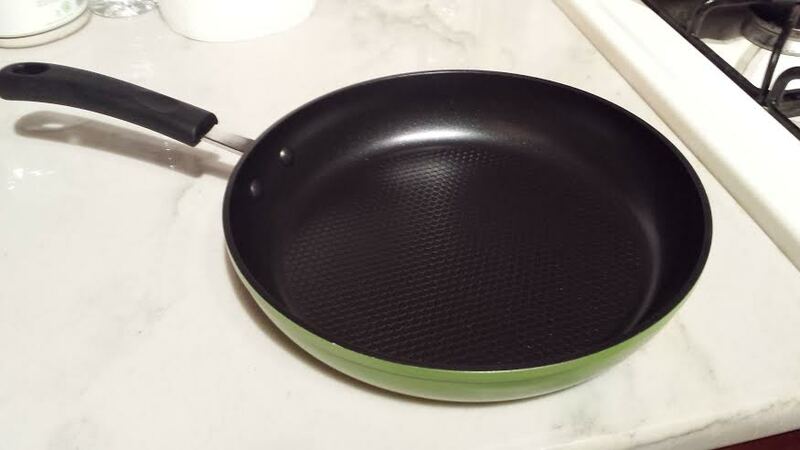 Upon looking at the pan you can tell right away that it is solidly made. The cooking surface is truly unique and I was wondering if food would get stuck to it. The weight of the pan felt good in my hand and easy to maneuver on our stove. After checking it out for a bit I decided to fire up the gas stove and heat up some leftover pasta and rice. The pan heated up very quickly which is a major plus. I didn’t use any cooking spray or oils because I wanted to see how well its nonstick surface performed. After a couple of minutes the pasta and rice was cooked well and it came right out of the pan and into the bowl with ease. I also heated up some corn as well with the same success. 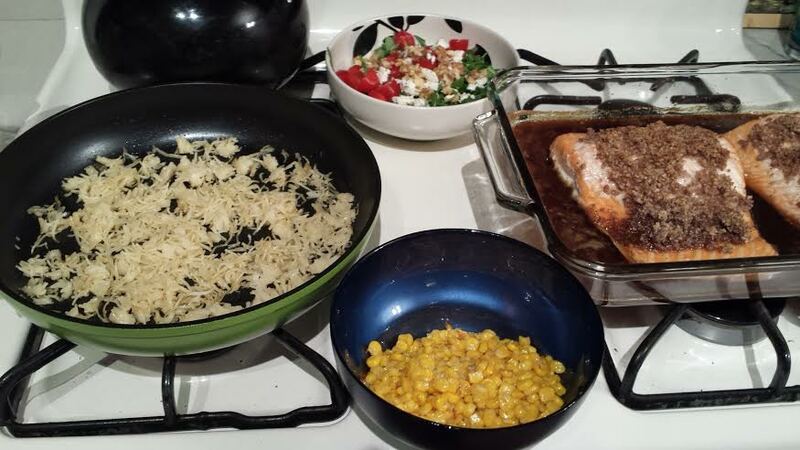 This was out Christmas Eve dinner and I really had a blast cooking all the above for my family in under 30 minutes, including the yummy Maple Pecan Salmon and yummy Arugula salad with some tomatoes and mozzarella cheese. The real test came the next morning when I decided to cook scrambled eggs and cheese. This is one dish that always gives me a tough time when it comes to clean up. The Ozeri pan was definitely up to task on this one. It heated the eggs up quickly and easily even under a low flame. After I was done there was some cheese and egg residue left in the pan, which surprisingly came right out when I rinsed the pan with hot water in the sink. There was no need to scrub the pan with a sponge or brush so I was quite happy with the results. The Ozeri pan is going to surely be my go to pan in the kitchen for the near future. 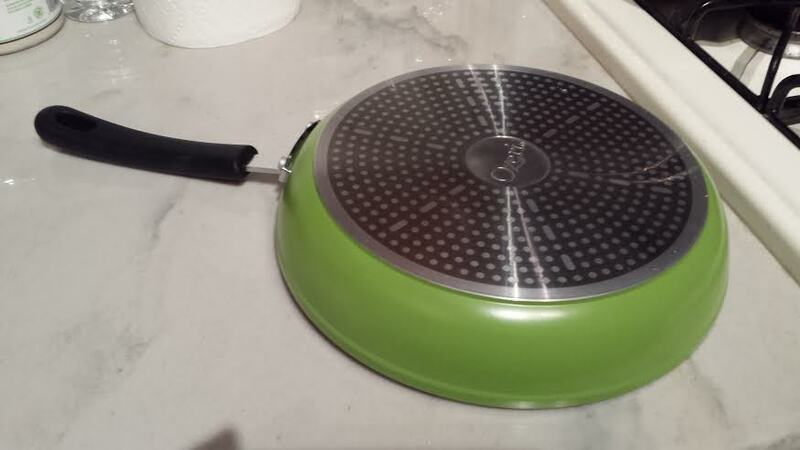 I am using this Ozeri Pan for a few weeks now and I really like it. We will see how it stands up to long-term use and if it is able to live up to its promises.